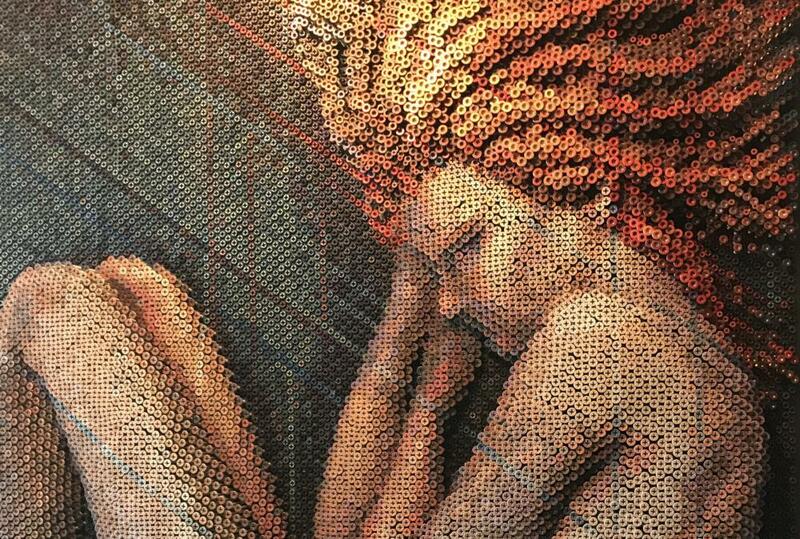 A quirky artist has created stunning three-dimensional masterpieces – using more than 30,000 screws. 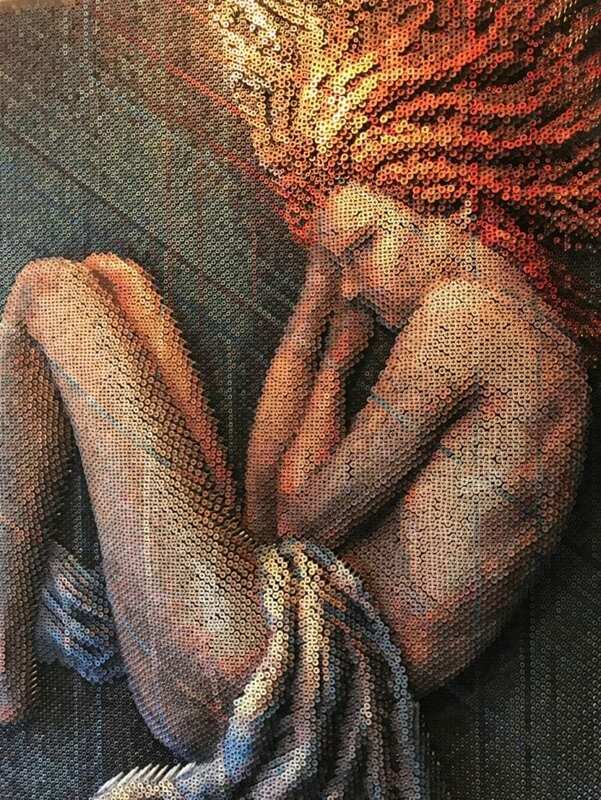 Bruce Mackley, 54, uses painted screws to build stunning works of ‘scrap art’, which he also calls ‘industrial mosaics’. The pieces can contain up to 30,000 screws, weigh up to 350lbs, and are up to seven feet tall. Bruce, from East Lansing, Michigan, has had no formal training in fine art and says he has spent the past 35 years working as an illustrator, graphic designer and creative director. He said: “I think what I do can be loosely defined as a type of ‘scrap art’, and I refer to them as industrial mosaics. “I began as a way to get back into fine art, and I enjoy the challenges and uncertainties of this particular medium. “I’ve only done two large ones so far: 9,000 screws, 160 lbs. 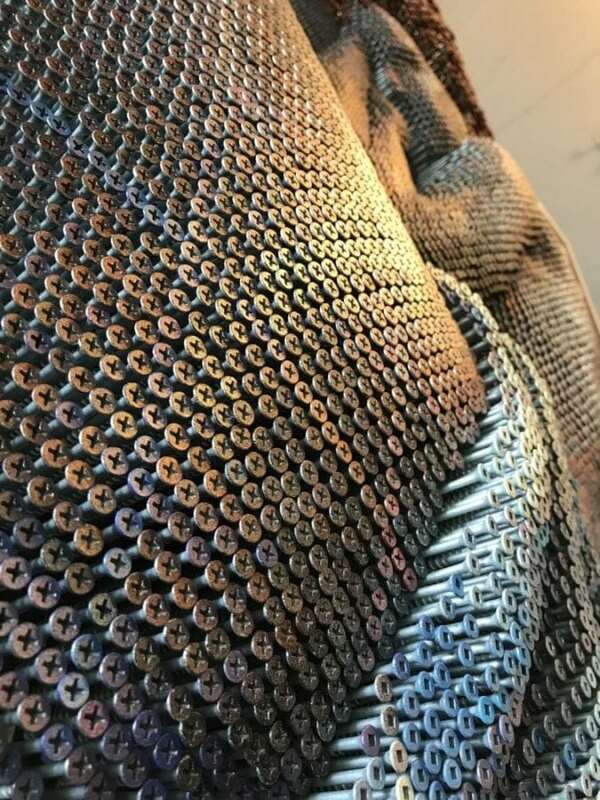 and 20,000 screws, 350 lbs. “I’ve also done some smaller accompanying pieces for art patrons to touch. “Mixing up the screw types – and there are almost infinite options – adds more detail. Bruce sets decking and framing screws into painted pine board at varying depths to create different levels and textures. 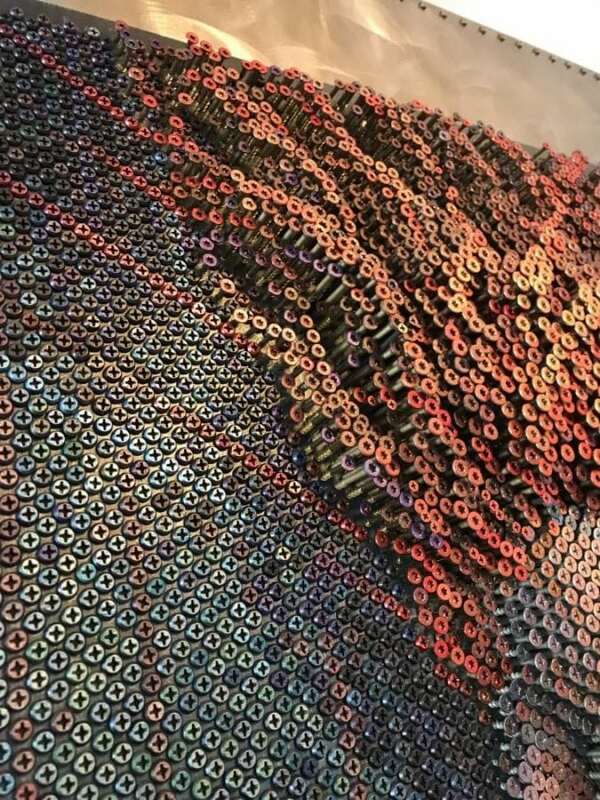 Descent, his largest piece, is over 7ft tall, and Bruce says painstaking hours of inserting and rearranging screws goes into each piece. 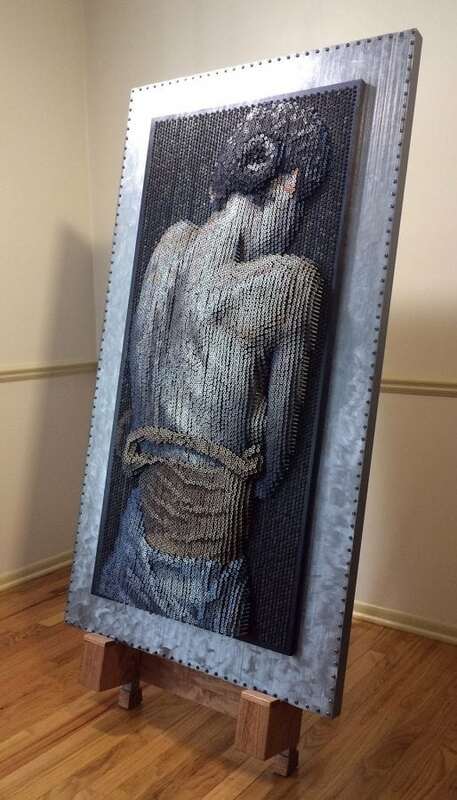 He added: “I’ve seen this type of art around before, done with nails and screws, but they never seem to fully take advantage of both the reflectivity of the metal as well as the potential mosaic effect. “I decided to use bright metal screws, and let some of that sheen come through the paint. “I also nest the screws together in hex arrangements, rather than putting them in rows. “It takes more time and hardware, but I think the end result is worth it. “My intention is to sell them – I sold the first, and the second is currently exhibited at in Grand Rapids, Michigan.